Patrons of Bossard Library can now choose from among a myriad of board and card games to check out all for free with their library cards. Pictured are members of the library’s Board of Trustees and the library director with the library’s collection of games. From left, are: Larry Shong, secretary; Elaine Armstrong, vice president; Jay Caldwell, member; Debbie Saunders, library director; Robbie Jenkins, president; and Leanna Martin, member. 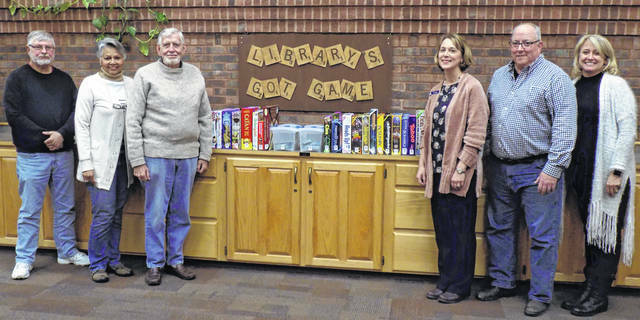 GALLIPOLIS — Bossard Memorial Library recently added a large selection of board and card games to its collection that can be checked out for free by library card holders. The board game collection adds to the list of Bossard Library’s popular non-traditional item collections, which include bicycles, mobile hotspots, and Launchpad lending tablets. Bossard Memorial Library Director Debbie Saunders stated that, with the inclusion of board games in the collection, the library wishes to promote social interaction among families and friends of all ages. The board game circulation program was launched in conjunction with International Games Week held on November 4-10. This initiative is supported by the American Library Association and seeks to connect individuals through their libraries around the educational, recreational, and social value of games. Included in Bossard Library’s board and card game collection are traditional games like Scrabble, Yahtzee, and Battleship, as well as many newer games, such as Heads Up, One Night Ultimate Werewolf, Splendor, and Pandemic, among many others. Patrons may also make requests for different games as new games may be added to the collection at a later date. The board game collection is located in the library’s Atrium and up to two board or card games may be borrowed at any one time by any library patron in good standing who is 18 years of age or older. The loan period for board games is two weeks with no renewals. No holds may be placed on board games. Games may be played in the library, but must first be checked out to the eligible borrower on his or her library card. Games cannot be returned to the library’s book drop, and borrowers are responsible for the safekeeping and return of all board game contents to the library. To check out the board game collection or to sign up for a free library card, stop by Bossard Library at 7 Spruce Street in Gallipolis. For the latest news on programs and events at Bossard Library, visit bossardlibrary.org.